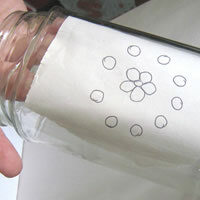 Use your old Nescafe coffee bottles to create recycled useful, usable flower vases. 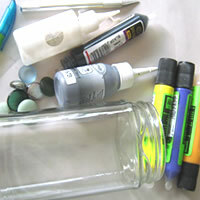 All items available from Crafty Corner. Select the design you want and trace the design onto a 7cm by 7cm piece of paper. Insert the piece of paper into the glass Nescafe bottle and press the piece of paper against the wall of the bottle. 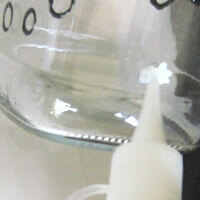 Trace the design onto the coffee bottle using the liquid lead. 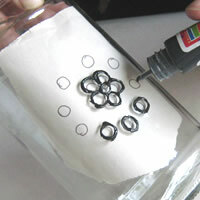 Move the piece of paper onto all sides of the bottle and copy till bottle is completed with the design. Let dry. Using the textured frost, glue colourful stones onto the coffee bottle. Place a small blob of textured frost onto the coffee bottle where you want to place the colourful stones, and then place stones gently onto the textured frost. 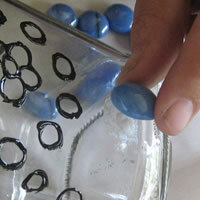 This is best done if the bottle is laying on its side as it will be easier to attach the stones. Ensure that the stones are gently placed on the textured frost and not applied roughly as this will cause a mess. 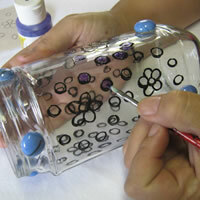 Look at your design on your bottle, where there are prominent spaces, fill with squiggles or swirls to create a full design. 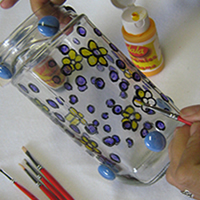 Colour in your design using the glass paint. Use a soft brush and colour sections of your designs solidly. Try not paint thinly as this will cause the vase to lose its effect. 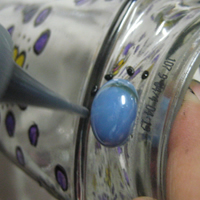 If you do not have glass paint you can use ceramic paint. Glue stones around the neck of the bottle to disguise it being a Nescafe coffee bottle. Your recycled Nescafe bottle vase is now complete!